With the recent shake-up at the television station, KDSM, Wynter Evans is trying her best to find a story that will not only secure her job, but also land her in the coveted anchor position. However, in going through possible story leads she sees a picture that could change her life. Looking past the black felt Mennonite hat the boy in one of the pictures looks exactly like her brother Ryan who disappeared nine years ago. After convincing her boss, Ed, that she should do a piece on small unknown towns in Missouri Wynter heads to Sanctuary with her photographer, Zac. Will searching into this town looking for her lost brother bring closure or more questions! Is it best to leave the past alone? By continuing to investigate is Wynter putting her own life in jeopardy? 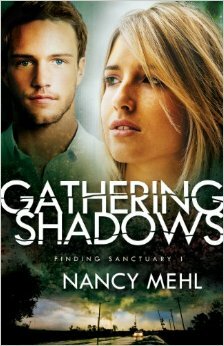 Wow, Nancy Mehl has produced yet another winning combination of twists and turns in her latest novel, Gathering Shadows. It is the first book in her Finding Sanctuary series. I would highly recommend this book. I will warn you that once you start reading Gathering Shadows it will be difficult to set down.